Could also be worked with DK weight yarn, held doubled (but highly recommend swatching first). The subtle waves of this cowl, inspired by the ripples on a calm sea, are formed by a variation on the familiar feather-and-fan stitch pattern: the commonly used purl ridges have been omitted. The cowl is subtly shaped by increases and ribbing at top and bottom, so that it flares slightly at the bottom, and narrows at the top. Worked in the round from the top down in chunky weight yarn, it is a quick and easy project. Directions for working the stitch patterns are given in both written and chart form. 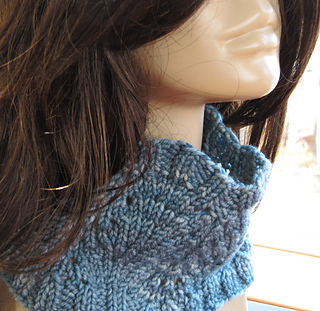 The pattern is also available as part of a three-cowl pattern booklet, the MacMahan Collection, for $7. Finished Size: 19”/48.5 cm circumference at the bottom edge, 15 ½“/39.5 cm at the top edge. 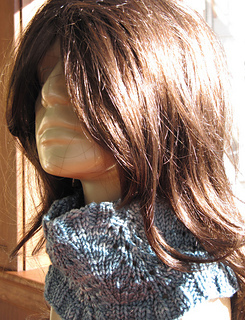 Height of cowl is approximately 5 ½”/14 cm. Materials: Yarn Madelinetosh Tosh Chunky, 100% superwash merino wool, 165 yds (151 m)/100 g skein, color Well Water, 1 skein. Needles: US size 9/5.5 mm: 16” circular. Adjust needle size if necessary to obtain the correct gauge. Notions: Marker, tapestry needle. Gauge: Approx 17 sts/23 rows to 4”/10 cm in lace pattern st. Measure gauge on blocked swatch.